Chainsaws are popular. You can actually even see them in kid’s drawings of a man cutting down trees. Let us not also forgot the movie that made chainsaws and Texas scary. There are different kinds of chainsaws: manual, gas-powered and electronic. Allow me to elaborate the differences. Manual chainsaws would be perfect if you have the luxury of time and if you wanted serious upper body workout. But, let us all be honest – not even body builders would enjoy chopping woods this way! Gas-powered chainsaws are the strongest type for me. I have tried one and I was able to finish chopping wood in less than 30 minutes. However, this is very noisy, heavy and the vibration makes me want to stop the process from time to time. On the other hand, there is also an electric-powered chainsaw. This environmental friendly version does not emit harmful fumes from gas consumption. 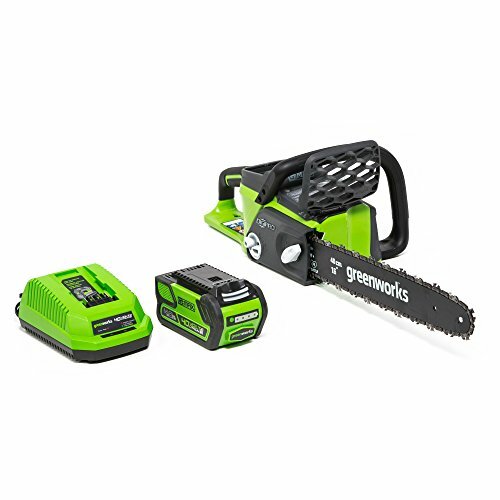 Another positive thing about electronic chainsaw is that it is cheaper than the previous one, and you do not have to worry to refill fuel every so often. However, since it can be corded, the workplace should always be located near an outlet. This then would limit the tasks we can do. What am I going to use the chainsaw for? In this article, I particularly indicated that the major function of my chainsaw is to chop fire woods. This made me decide to go for a 16” machine. If you need to chop off trees, 16” can also do the job but do not expect to be finished immediately. Where can I stock it? One concern would always be safety. Do not go for big chainsaws if you do not have a proper storage as it can cause accidents. What would be most convenient for me? Gas or electric? If gasoline sources are far from you, you should choose the other options. Will I be comfortable every time I use it? Is it too heavy? Does it vibrate too much? Are the handles soft? And the last and most important question of them all would be…..”How much am I willing to spend for it?” as this will be the biggest dealmaker or deal breaker for any kind of purchases. One of my favorite features would be the handle. As it has a soft inlay and the trigger is ergonomically located. It does not require too much use of gasoline to operate. Nature lovers would appreciate this product because of this feature since it has low emission levels. Warranty: 2 years but if you purchase additional accessories and if you register your product online, the warranty can be extended to 4 years. The manufacturer of this product created auto-tension chain system. Chains on this chainsaw are then not expected to tighten too much. Users will have no problem lubricating the chains from time to time because there’s an oil storage that lubricates the engine and chain as needed without human intervention. These top 3 choices share same characteristics such as 16” blade, low kick-back, and high-quality performances. My goal is to give you the best choice for each kind of chainsaw while orienting you about their pros and cons. Know the manufacturer’s instruction by heart. This is not a toy and it could cost a life. Never use the tip of the blade when sawing to avoid kick-back.